The most important adversary to breast cancer screening is fear, says Dr. Tamar Sella, head of the Marlene Greenebaum Multidisciplinary Diagnostic Breast Center. As Dr. Sella explains, there are two pathways that lead to a 90 percent cure rate. There is preventive care, where the idea is to find the cancer while it is still small, and there is treatment with today’s latest medicines and procedures, such as biologics and immunotherapy–­all personalized to the woman’s particular cancer when possible. Who else is at high risk other than women with a BRCA mutation? While only one percent of people diagnosed with breast cancer are men, those men who have a BRCA mutation, says Dr. Sella, are at higher risk, not only for breast cancer, but prostate and colon cancer as well. Men don’t need to be screened with imaging, she explains, because the cancer can be picked up clinically, but they should have genetic testing if a BRCA mutation has been found in their family. Transgender individuals who take female hormones to transition are also at higher risk for breast cancer, since hormone therapy has been linked to its development. They, too, Dr. Sella says, should be monitored closely. 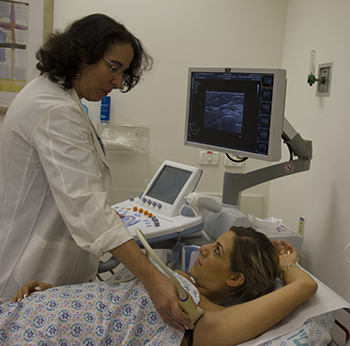 At Hadassah’s comprehensive imaging center, which opened in 2009, women can have their imaging done and read by the radiologist right afterward. If the news is bad, they can immediately see a physician to map out a plan. As Dr. Sella explains, “It takes the ‘What now?’ out of the equation.” Hadassah’s center, she adds, is the only one in Jerusalem that houses all the imaging technologies under one roof. Hadassah has also offered 3D mammography since 2011, shortly after it was first introduced. This tool takes a series of images at different angles. Then the computer configures the images to show slices of the breast, yielding 30 percent better detection of very small cancers. MRI is an adjunct tool that is often used for women who are at high risk—that is, they have over a 20 percent lifetime chance of developing breast cancer. The MRI provides functional imagery, where you can see the blood vessels that cancer cells generate, as opposed to mammography, which gives you an anatomical view. MRI also enables the radiologist to evaluate cancer-in-situ (superficial, noninvasive cancer) and to determine whether it is high grade or low grade. If it is high grade, it will usually require a different treatment approach. One of the latest developments in breast cancer imaging is the contrast enhanced mammogram, which allows the radiologist, with the help of iodine dye, to look at the same blood vessels that MRI does, as well as providing the anatomical view. This imaging tool, now in clinical trials, will be a great addition, Dr. Sella says, when a regular mammogram reveals a suspicious mass and MRI is not available. It is not meant for routine screening, however, because it involves exposing the patient to more radiation. Another new development is ultrasound elastography, which reveals whether a mass that appears on an ultrasound is soft or hard, taking away unnecessary worry for the patient if it reads as soft. There are more advances on the horizon in breast cancer diagnostics, Dr. Sella reports. Computers, via artificial intelligence, will assist radiologists in reading images. This development will, she explains, help to mitigate the effect of the current global shortage of radiologists. In addition, individual women will be slated for specific diagnostic protocols that more accurately align with their personal profiles, such as breast density and genetics. We don’t yet have enough information to do that, Dr. Sella says, but once we do, this type of personalization will become the norm.